The Windows operating system does not come with an option to monitor applications effectively. The only option available are the various event logs that are automatically generated by the operating system. The event log in combination with the Windows Task Scheduler can theoretically be used to restart crashed applications. But the configuration is not that easy and it is usually a better idea to use a third party application monitor to perform the task. The following article will take a closer look at five application monitors and restarters for the Windows operating system. These programs monitor applications that the user configures. They usually also come with options to react on certain events. All application monitoring options are displayed in the main interface of the Restarter program. It displays the list of running processes on the top with the option to select one that should be monitored by the application. The monitoring interval can be configured as well as several startup and error parameters including killing the application if it becomes unresponsive and restarting it if it is not running anymore. Easy to use, manage everything in one program window. 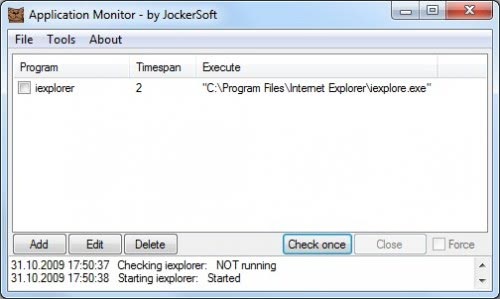 Application Monitor is another program that can monitor and restart applications that have been added to the program by the user. The process of adding applications to the software is slightly more complex as the user needs to select the program executable from the computer's hard drive manually. Multiple executables can be added to the program this way. 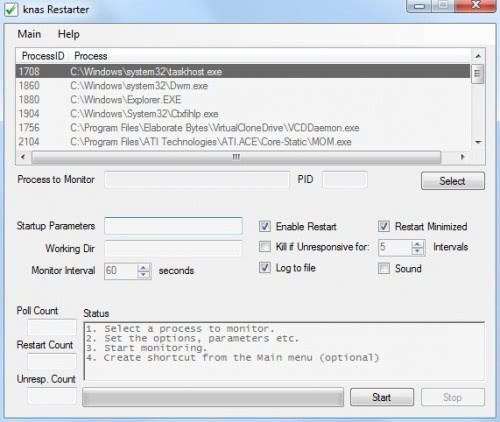 Application Monitor will automatically check if the program is running, restart it if it is not. It can write events into a log file and notify the user by sending an email to an email account if the SMTP server settings are filled out in the program's options. Keep Running is a basic application monitor that needs to be configured in a separate configuration file. It is a portable application that can monitor one application in the Windows operating system. The administrator needs to add the full path to the software and other options in the configuration file. It is also only possible to monitor one application at a time. A positive side effect of the bare-bone approach is that the process of the program uses the least amount of computer memory in the test field. 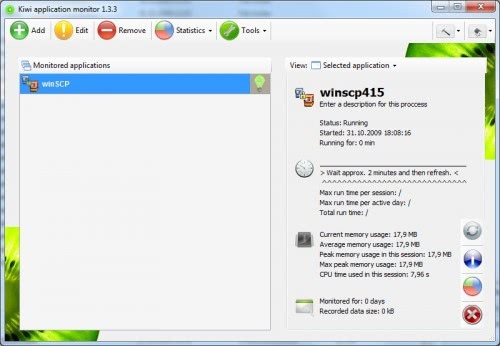 The free version of Kiwi Application Monitor offers basic options to monitor processes in the Windows operating system. It is possible to monitor multiple applications, view statistics, configure email notifications and logging options. It is possible to configure several options to close or restart applications if events are triggered. Control Running Programs needs to be run in compatibility mode in Windows 7. The program can be used to control three distinct program behaviors: Program instances, starting and memory usage. It is for example possible to configure that a program should be restarted if it is not running (or crashed), that only one instance of the program should be open at any time and that it should be closed if it exceeds a certain amount of computer memory. CRP supports logging but no notifications. To be fair native functionality of Windows services is suited to keep stuff running. As long as it is originally made to be service or can be converted to such (there are limitations to latter). Personally I hadn’t ever had a need to keep something running that wasn’t some kind of service. So I just stick with that. Actually, Restarter IS a portable application. It only uses the files in the Restarter folder (no registry settings either), so you can copy or move them anywhere you like.